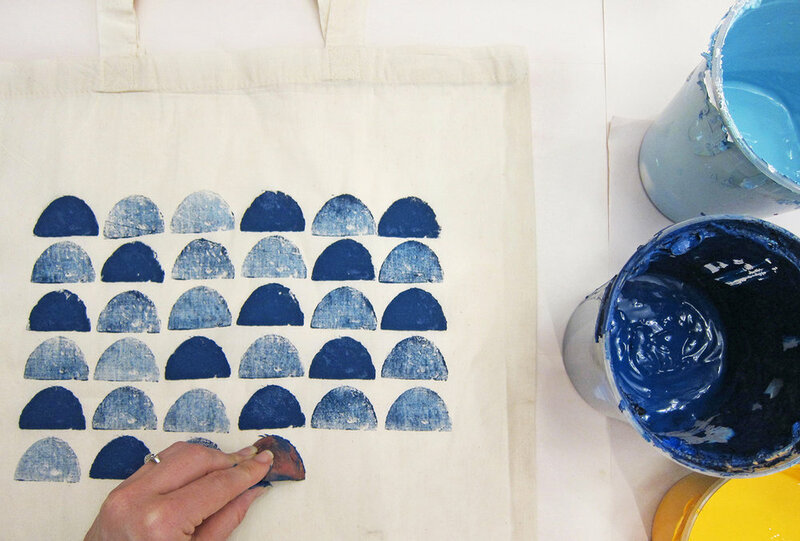 Learn how to create spud-tacular graphic prints and take home your one-of-a-kind tote bag and dish towel. We’ll start by reviewing the overall inking and printing process, showing you a few techniques and the basic how-to's. You’ll then work on cutting your potato into simple graphic shapes and try out a few test prints to get the hang of it. Once you have become a potato printing master, we’ll use your newly learned skill to print your masterpiece on a tote bag or flour sack dish towel. Your take-home goodies (tote bag or dish towel, and art prints) can let you show off your creative side to the world, or can make for great homemade holiday gifts for your mom, bestie, or pet-sitter. All supplies will be provided in class, as well as some refreshments to get your creative juices flowing. Please be sure to wear clothes you don’t mind getting a few ink stains on and bring an apron if you've got one! *Since this process involves wasting food that many need to feed themselves and their families, $5 from each ticket price will go toward Capital Area Food Bank, a local organization working to solve hunger in the Washington Metro area. Jodi is the creator, maker, designer, and illustrator behind The Neighborgoods - foodie-themed goods for everyday home and life. In addition to her home-goods business, she also runs a graphic design business, Hello Neighbor Designs, focusing on branding and packaging for clients in the food industry. She loves combining her two passions of food and design in both of her businesses, and is excited to take it one step further designing WITH food in her potato printing class. Follow along with her designy food adventures on instagram @TheNeighborgoodsWithLove.